Here's an easy guide on how to use the Smart Select feature of the new Galaxy Note 4 to capture image from a video clip, and send it via text message to your friends. 2. We'll use YouTube app in this example, so tap on YouTube from the Apps screen. 3. Now start watching any YouTube video. 4. Hover the S Pen a few millimeters over the screen and press the S Pen button. 5. Tap on Smart Select to continue. 6. Next, tap and hold the tip of the S Pen on the area of the screen you want to capture and then drag the S Pen to highlight that area. 7. You should then see the Smart Select options screen displays. Among the options you can choose from/use include Save in Scrapbook, Share via, More options, Extract Text from item and Collect. 8. Tap on the Collect icon to collect the highlighted screen/image area. 9. When the Smart Select floating window appears, tap and hold, and then drag it to another part of the screen. 10. Tap on the + icon on the floating window to collect another picture. 11. Tap and hold the tip of the S Pen on the area of the screen you want to capture, then highlight the area using the S Pen. 12. Tap on the Collect icon to continue. 13. Now press the Home key to get back to the Home screen. Take a look at the number in the lower right corner of the collected image on the Home screen. That number refers to the number of images currently collected. 14. Tap on the Create Message icon. 15. Drag the Smart Select capture into the message input area, and then lift up the S Pen. You should then see the contents are added to the body of the message. 16. Tap on the Add contacts icon. 17. Next, tap to mark the checkbox next to the contact to whom you want to send the message (recipient). 18. To clear the keyboard from the screen, press the Back key. 19. And finally, tap the Send icon to send the message. 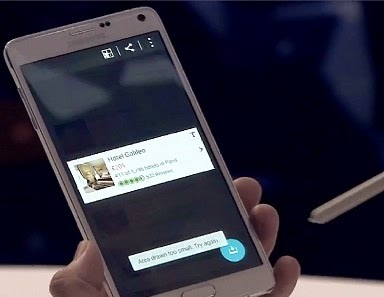 That's one way of sharing collected smart select images via text message on your Samsung Galaxy Note 4 device.